I have always been mesmerised by the beauty that can be created by mixing colours and brushstrokes and have been fortunate to dedicate my career to the craft of art and poetry. My work is generally referred to as abstract, this is by intention as from a young age I have strongly felt that a painting needs to leave room for the viewer to connect and form their own interpretation. Painting is a silent poetry and poetry is art that speaks, they are different forms of the same expression but both of them have been an outlet to freely express myself. I chanced upon Anisha at an art exhibition I attended when visiting London and have been so appreciative that I decided to go along that evening as she was the absolute highlight. Her work is mesmerising. 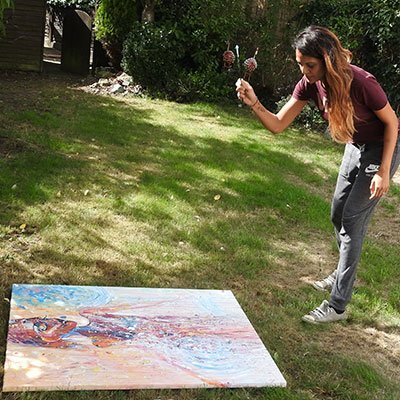 She paints from the heart in a completely fluid and seamless way. Her art is subtle, harmonious, alive, tantalising, deep, evocative, moving, spiritual, and expressive of an insight into the human soul. I absolutely love it and have already bought 7 of her pieces and will continue to buy her wonderful creations that I never tire of viewing. Everyone that sees them agrees that she is a true talent. As a lover and collector of art I must say how incredibly proud I was to have purchased an exquisite painting by the artist Anisha Samani. Her somewhat mysterious yet stunning art tells such a powerful story and a definite must have for collectors. A huge fan. 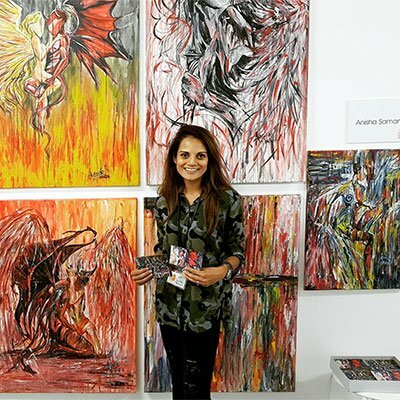 I’m no art aficionado, but you can’t help being captivated by the sheer beauty of Anisha’s work, with its raw energy and striking use of color. I have always loved the power and contrast of “Twisted Fantasy”, but was equally mesmerized by the dreamlike qualities and subtlety of “Departed”. and enable better outcomes for those less fortunate. At the age of thirteen I moved to London with my mother and two sisters. My mother instilled a strong sense of pride and feminism in all of us and has led me onto a path of independence and strong self-belief. This is something I portray in my work as well as extenuating the beauty and strength of (mostly) the female form by using bold and vibrant colours to capture my emotions. My journey is a colourful one. I was born and raised in Kenya and the thirteen years I spent there were the happiest childhood memories. I was surrounded by the abundant plains of Nairobi which were covered in the darkest hue of red silt, as well as such awe-inspiring landscapes and wildlife. Beyond the beauty of nature, I was brought up to be humble and acknowledge the poverty and hardships of others. This is something I still recognise today and I frequently offer my work to causes so as to empower and enable better outcomes for those less fortunate. At the age of thirteen I moved to London with my mother and two sisters. My mother instilled a strong sense of pride and feminism in all of us and has led me onto a path of independence and in believing in myself. This is something I portray in my work as well as extenuating the beauty and strength of the female form by using bold and vibrant colours to capture my emotions. My inspiration comes from artists such as Jackson Pollock and Wassily Kandinsky and like them I aim to exploit colour and form to create an aesthetic experience that engages the sight. My signature style is to allow the paint to drip down the canvas which can be just as powerful as a brushstroke when telling a story. Finally, thank you for stopping by and I do hope I have inspired someone, somewhere and I really hope you connect with my work.